I feel writing this review is highly redundant taking into account how well known and universally appreciated it is. Honestly, what is there that I can hope to disclose you may not already know? It's a film that is not only a product of it's own time, but it's also one that looked forward as well. Silent cinema is obviously an almost defunct institution these days for numerous reasons, but when you experience films such as F.W. Murnau's Nosferatu: A Symphony Of Horror, you are treated to a cinematic experience that is all but dead. 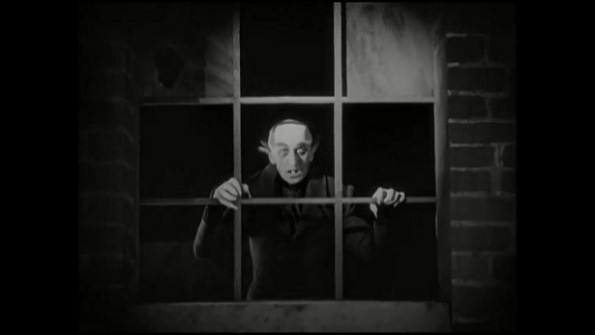 German Expressionism remains to this day an influence on cinema as we know it today, and if you are looking for a crash course in this medium, Nosferatu is a prime place to start your quest. 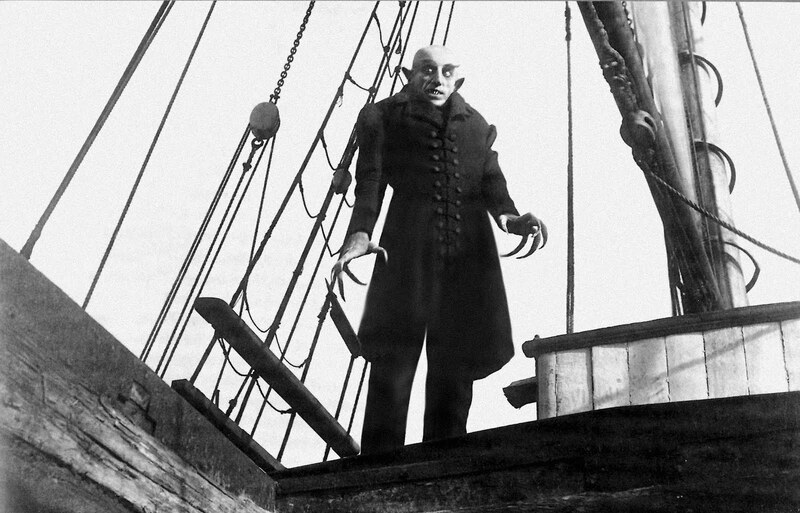 The way I figure it, Nosferatu did not merely pave the definitive way for vampire cinema but truly lives up to it's moniker of being a symphony of horror. A symphony in traditional terms is something aural, but here, the tale of Count Orlok is a visual harmony which one can not only appreciate with the eyes but with the mind. This movie ignited an orchestra that continues to play today, one that is heard by us all. Naturally Count Orlok isn't who we automatically think of when we hear the name 'Dracula' (Bela Lugosi had and always will hold that honor), but Orlok is evidence that not all vampires have to be charming, well-suited lounge lizards who have a way with the ladies. In fact, he is a downright grotesque; shaven head, spindly fingers, bulging insectoid eyes and sharp, ratty incisors, Orlok is more of an rodentian abomination than a human being who prefers the company of plague-ridden rats than civilized individuals. Schreck's eerie, controlled movements and shocking appearance allow the viewer to see they are in the company of something supernatural yet hypnotically terrifying. Schreck's appearance has spawned and inspired countless iterations of bloodsuckers and for damn good reason. If you ran into this fellow in a darkened alley, make your peace to the divine. Among an array of reasons to admire and be thankful Murnau made this movie, it's greatest success story was that it was even made. Florence Stoker, the widow of Bram Stoker, wanted the film to be banned and destroyed because it infringed on her husband's creative property. Necessary details were omitted in order to dodge the bullet and the result was a Gothic and nightmarish fairy tale. When you think about it, if those changes hadn't been made, the history of Dracula on film would have been altered forever. Glory to Lilith's Bosoms Murnau and company played it smart. When Werner Herzog for all intents and purposes remade the film in 1979, he too followed this agenda, ensuring Klaus Kinski's vampire was a pathetic, simpering and perpetually miserable creature who brought disease and calamity everywhere he went. Nosferatu, is what you could consider a nightmarish tale of sickness, not only the physical kind, but also the mental and social. Although Murnau's film does not make this connection overt, it is still there and it's something every era can relate to. Orlok is a metaphor for the cruelty of suffering, illness and the indiscriminate nature of death that also happens to take the shape of a human. 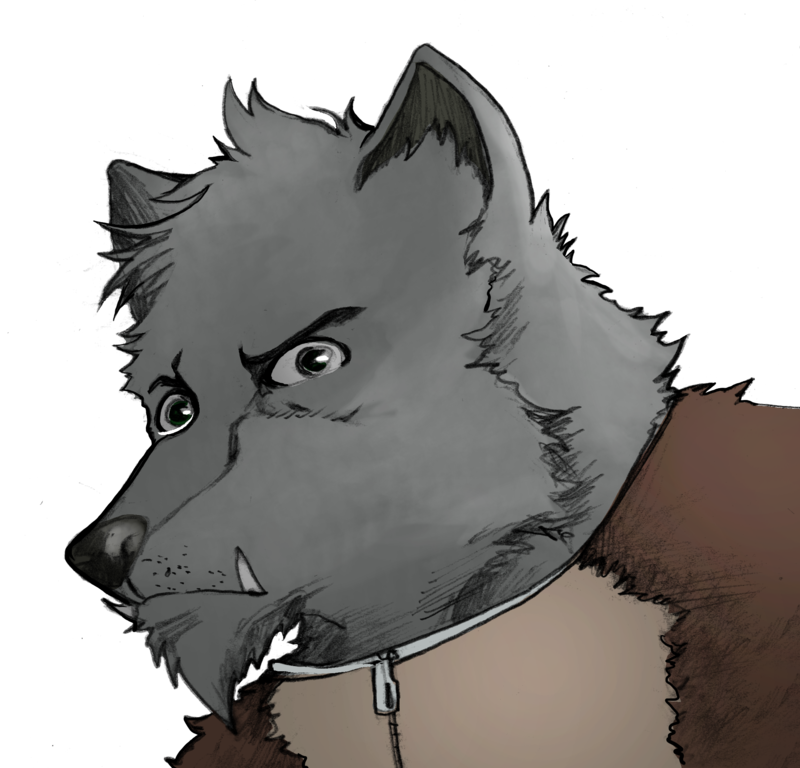 Orlok cares not about who he infects, he is aware of the turmoil he brings, but he cannot help it- it is his nature. He is the facilitator of damnation and the agent of affliction. Although Orlok is by no means a romantic creature, he becomes utterly infatuated with Ellen, the virtuous wife of Thomas Hutter because of her pure soul (and quite possibly, her presumed virginity). To him, her unsullied blood is the song of life, a temporary solace from his suffering, and it is this single-minded obsession that eventually drives him to his doom. There is no reconciliation of lost love, no treasured moments being recalled; Ellen offers herself as a sacrificial lamb for the beast Orlok and it costs both dearly. Beauty and ugliness is subjective, but I am in the camp which firmly believes that not only is Nosferatu crucial and inventive film, it deserves every bit of praise it receives. Think about it, all of those years ago, the magic of the movies was but in it's infancy and like all children, it needed time to find it's feet before it could walk. Audiences were required to call upon the power of their minds in order to fill out the blanks that these films left, they had to make do with what they were given in terms of what they did see. Despite these films were magic tricks in their own right- they knew ultimately what they were watching wasn't real, but their presentation is what inspired audience's imaginations. Certainly not all silent films were as masterful as this, but it goes to show the ingenuity and creativity of celluloid artisans back before audiences were constantly bombarded with CGI, explosions and other flashy treats we take for granted these days. Nosferatu is not just a film, it is a legacy, and legacies will continue to scuttle up the stairs of immortality after their propagators have left this world.